Which website do you choose to host your blog? Do you have to know anything about CSS codes? What do you even want to write about? All of these questions flood your mind and instantly make you want to walk away from your computer. But have no fear! We are going to take a few minutes and simplify the chaotic mess on how to create a blog. First, ask yourself what kind of blog would you like to create. What do you enjoy reading about, writing about, or even just enjoy in general? If you’re not sure, get yourself a journal and write about whatever comes to mind. After you spend a while writing (whether it’s days, months, or even a year), read what you wrote to look for an underlying theme. Maybe you wrote about fitness and health. Maybe you wrote about fashion. Maybe you even wrote about your cat and how lovely he is (and there is nothing wrong with that! ), but wherever your mind wanders then maybe that’s your theme. If you’re an expert about something, you could share your expertise to the world. Just allow yourself some time to plan out what you would like to do. If you start a blog with no heading, then sooner or later you will find yourself with an awesome blog design and no words to fill the screen. The majority of these blogging sites are for free (with the exception of Typepad), but some upgrades have costs. Each blogging site is very easy to use, and don’t worry about learning any codes, because the sites do that for you. The best part about all of these sites is that you can completely make them your own. You can add pictures, fonts, theme colors, widgets, and your newsfeeds. You can also add different pages to your site like an “About Me” page, contact page, video page, and so on. Now it’s time for you to design and write. 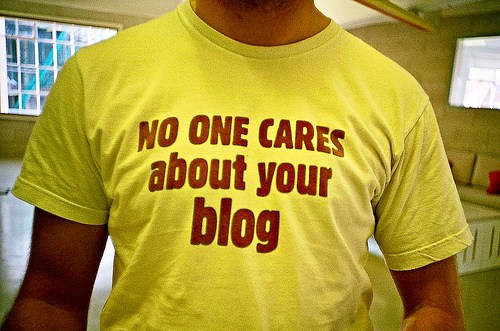 Your blog is absolutely your own, so let your imagination run wild. Design however you want and write about whatever you want. It might take you a while to get your blog just the way you want it, but stick with it. Lastly, remember this is all about you and the thoughts and stories you want to convey to the world. Have some fun with it! Blogging can be a great way for you to relieve stress, write down your thoughts, or even record great memories that happen in your life. Bottom line, have fun and let the blogging begin!